Photographer(s) Appreciation: Thank you to Anne Elliot@Flickr for once again sharing a photo, this time of Salvia viridis 'Pink Sundae' (shared via the Botany Photo of the Day Flickr Pool). With its striking complementary colours, I think that the common name of painted sage aptly suits Salvia viridis. Salvia viridis grows on limestone in rocky terrain. It has a native range including Mediterranean Europe and Africa, thus it is well suited to dry environments. Painted sage is known by a long list of common names in English including annual clary, green-topped sage and red-topped sage. ‘Pink Sundae’ is a cultivar specifically selected for its bright carmine-pink bracts (source: Annuals for Every Garden Issue 174). The vibrant bracts of Salvia viridis overshadow the small flowers that bloom in summertime for a month-long period. Growing in robust multi-branching clumps, plants stand 0.2-0.6m (8 in. to 2 ft.) tall with a similar width. The seeds can be used for the brewing of ales and ciders, described on Wikipedia as “greatly increas[ing] the inebriating quality of the liquor.” Pollinated by bees, Salvia viridis is also used in the production of honey. For more pictures, see Salvia viridis via the Flora of Israel Online. However, it should be noted that Salvia viridis is known as Wild Clary and the addition of Clary (or Clary Sage), Salvia sclarea, to increase the intoxicating qualities of beers was well-known. There may have been some confusion here between the types of Clary. This is what A Modern Herbal says of Salvia sclarea. Many essential oil vendors will warn against mixing alcohol and the use of clary sage oil from Salvia sclarea. I once accidentally did that when having a bath with a few drops of clary sage oil after drinking a small amount of vodka. The ceiling became profoundly textured and mobile. It was simultaneously worrying and profoundly boring. Robert Tisserand has mentioned this contraindication in his books but the Tisserand webshop does not mention it. Salvia viridis has none of the sclareol that is characteristic of Salvia sclarea essential oil. The whole book is online and has some fascinating historical information. It is incredibly out-of-date as it was published in 1931. It should not be used for medical advice. I believe I have found the source of confusion. “The new family herbal; etc” by William Meyrick, published in 1790. The section headed Clary, Salvia horminum, is quite clearly describing Salvia sclarea, not Salvia horminum. The plant is described as biennial, not annual, three to four feet tall rather than a maximum of two feet, large flowers rather than small and a native of Greece rather than Britain. The rest of the description also clearly fits S. sclarea rather than S. horminum. The uses given cover all those repeated by both Wikipedia and A Modern Herbal, though with some extras. The leaves and seeds of Clary have a warm bitterish taste, and a strong aromatic, but somewhat disagreeable smell. They are of a cordial, corroborating, and detersive nature, and are useful in hysterical complaints, the whites, &c. Lewis. A conserve of the tops of Clary warms the stomach, helps digestion, removes flatulencies, acts as a cordial, and is good in the head-ach, lowness of spirits, and all other nervous disorders. Hill. An infusion of the leaves is a good gargle for putrid spongy gums; and the powder of them snuffed up the nose excites sneezing, and a discharge of watry humours from the head; the leaves or seed put into the vat with ale while fermenting, greatly increase its inebriating quality. A clear case of a small error in print being repeated down the centuries by subsequent authors. Although the confusion is understandable. Caspar Bauhin had called the plant Horminum sclarea in a book published in 1671. Linnaeus named both species in 1753. Botanical descriptions in the 18th century were cursory and tended to refer to previous descriptions making it difficult to understand which plant was being described. Linnaeus has Salvia horminum as Bauhin’s Horminum sativum and Salvia sclarea as Bauhin’s Horminum sclarea. Just to clarify what I wrote before. https://www.biodiversitylibrary.org/page/358048#page/36/mode/1up with S. sclarea on page 27. Oops, my mistake. I was thinking of Salvia verbenaca, another plant also called Wild Clary that is native to Britain. Salvia horminum is native to Southern Europe including Greece but so is Salvia sclarea. I shouldn’t stay up so late. I don’t know about Canada but the RHS page shows them as pretty adaptable to most conditions if you don’t go below -15C. They like well-drained soil. 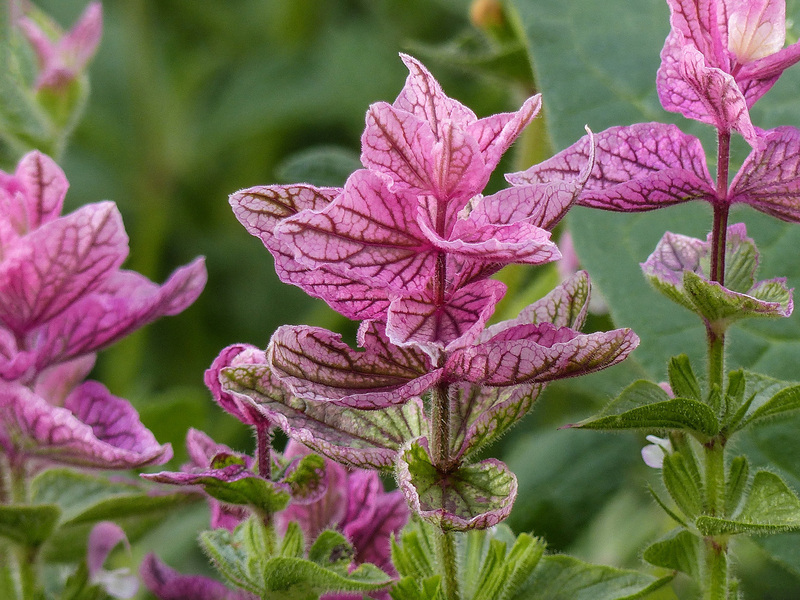 However, Washington State prohibits the import of seed from the very similar Salvia sclarea and Salvia pratensis as noxious weeds, so it might not be the best idea to introduce them. Speaking of salvias, salvia coccinea ‘Summer Jewel Red’ in a container is still blooming on my patio in False Creek. What a great plan, beloved by hummingbirds.